Founded in 1992, CBA Sports is a sports construction firm specializing in performance athletic surfacing, sports floor systems, and sports components for both indoor and outdoor sports flooring projects. Our company is one of the largest and most proficient sports construction firms and is driven by the passion and commitment of its people. Every project, regardless of size or scope, gets the same attention to detail from a single flooring component to an entire sports complex; this is our philosophy and pride. From indoor gymnasium flooring, running tracks and weight rooms to outdoor basketball and tennis courts, CBA Sports is a sports construction industry leader. Our clients range from UGA, Georgia Tech, GSU, FSU, Atlanta Hawks to a host of professional athletes, public and private sports facilities and homeowners throughout the world. We love providing sports flooring for all activities and have the expertise to solve any question or problem that may arise. 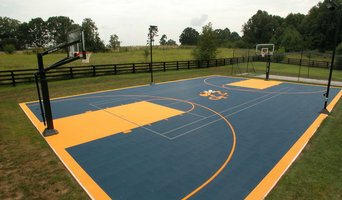 First and foremost, your Georgia backyard court builder should have in-depth knowledge of sport rules, regulations and standards: court dimensions, net heights, lane widths and much more. If you’ll be teaching your friends, kids or others how to play, or if you plan to play on a competitive level, following national guidelines is important. Backyard court builders also keep tabs on the latest in athletics technology to provide you with the most updated options possible for your North Druid Hills, GA court. With your input, they’ll design a space that’s customized for your wish list and your home, then handle the construction. When the inevitable wear and tear starts to show, your Georgia backyard court builder can repair, resurface or replace the aging elements. To ensure consistent quality and style, your backyard court contractor might also work closely with a North Druid Hills, GA general contractor, remodeling contractor or landscape professional. Here are some related professionals and vendors to complement the work of backyard courts: Outdoor Play Systems, Landscape Contractors, General Contractors. Narrow your search in the Professionals section of the website to North Druid Hills, GA backyard courts. You can also look through photos to find examples of North Druid Hills, GA courts that you like, then contact the contractor who worked on them.